2010: Canal Houses in Trenton have seen significant progress in the past four years. 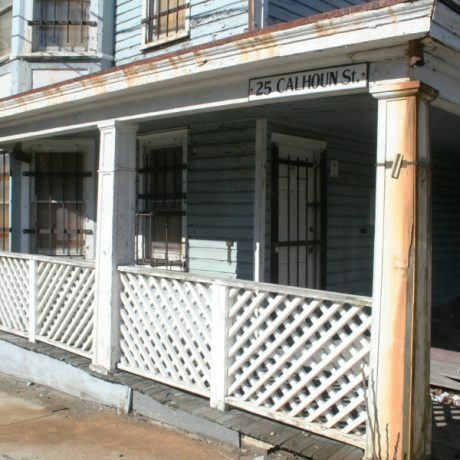 The Calhoun Street Canal House has been fully restored by the State of New Jersey. The state is now offering the property for lease to non-profit organizations. Additionally, the Hanover Street Canal House has been stabilized, and the Prospect Street Canal House, which is occupied, recently benefitted from front porch repair. When the Delaware and Raritan Canal opened in 1834 it was not immediately profitable, and some aspects of the business that its investors envisaged, such as passenger traffic, never materialized. But from the mid-1840s until the 1870s the canal was a major route by which anthracite coal (the energy source that fueled the industrial revolution) reached the factories of New York and New Jersey from northeastern Pennsylvania. It is hard to overestimate how important the canal was to the political economy of mid-nineteenth century New Jersey, and a remarkable amount of its physical fabric survives. Thirty-six (of forty-four) miles of the main canal and all twenty-two miles of the feeder survive, along with nineteenth-century bridges, cobblestone spillways, hand-built stone arched culverts, and locks. Approximately twenty bridge and lock-tenders’ houses still grace the banks of the canal in places like East Millstone, Griggstown, Kingston, Lambertville, and Trenton. However, at least twelve canal houses and several other small structures have been lost, and the remaining canal houses, which have suffered from years of inadequate maintenance and neglect, are seriously threatened by water penetration and subsequent wood rot. In some cases, floors have already collapsed. Without stabilization, we will soon lose these buildings. The Delaware and Raritan Canal State Park is now an extremely popular element of the state’s park system. It is used for canoeing, fishing, hiking, jogging and bicycling by roughly a million visitors a year. Yet the canal houses that remind us of the significant history of the waterway are endangered. The state has not managed the properties as if they are important to the park; many are vacant and deteriorating. It has neither provided funds to maintain them nor shown any willingness to restore them now that they have fallen into disrepair. PNJ believes the state should form partnerships with interested private groups to ensure that the buildings are rehabilitated and occupied, which will reduce the threat of vandalism, so they can continue to help tell the story of the historic D&R canal. Stabilization and restoration plans are underway for some Canal houses- the Bridge Tender’s house in Trenton and the Supervisor’s house in Trenton, the Griggstown Mule tenders barracks, the Bridge Tender’s houses in East Millstone and Weston. These properties will be restored – by the Division of Parks and Forestry or through partnerships with municipalities that they are located in or by private developers.